WordPress makes it easy to extend functionality through the use of plugins. Jump into the world of plugins by trying one (or all) of these free popular plugins in the WordPress Plugin Directory designed to help you manage your website or blog. Try out each of these plugins on a development copy of your WordPress blog or website and explore the features that they offer. Then visit the WordPress Plugin Directory and click the Most Popular link to try more popular plugins. All in One SEO Pack: The All in One SEO Pack plugin is one of the most popular plugins in the WordPress Plugin Directory (based on downloads). This plugin installs a complex set of features that help any WordPress blog or website administrator get better results from search engines, such as Bing, Google, and Yahoo!. Many of the features are for experienced users, but the plugin still offers much that a beginner can do to optimize a blog or website for searches. 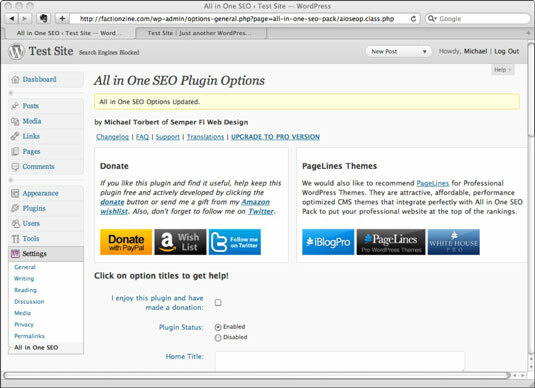 The All in One SEO Pack plugin for WordPress is available as a free plugin at the WordPress Plugin Directory. You can install it either by downloading the file from the WordPress Directory or by clicking the Install Now link under Add New Plugins in the WordPress Dashboard. Subscribe to Comments: The Subscribe to Comments plugin allows anyone commenting on a WordPress blog to sign up for an e-mail notification of subsequent comments or entries. 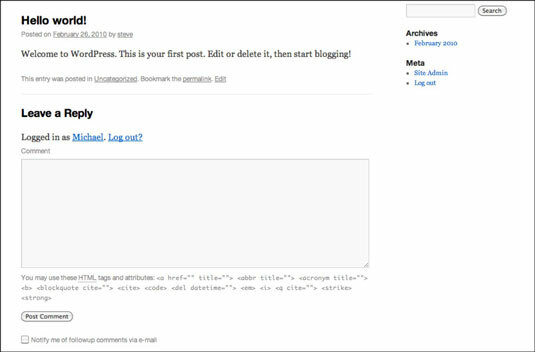 This feature allows visitors to your site to follow the thread of comments on a blog post. For many blogs, this helps visitors see when someone responds to their comment or posts something new that they may want to comment on. This plugin includes a full-featured subscription manager that commentators can use to unsubscribe to certain posts, block all notifications, or even change their notification e-mail address. After the plugin is installed and activated, users see the Notify Me of Followup Comments via E-mail check box below the Leave a Reply section of a blog post. Users can leave a comment and check this box to receive e-mail notifications of later comments. 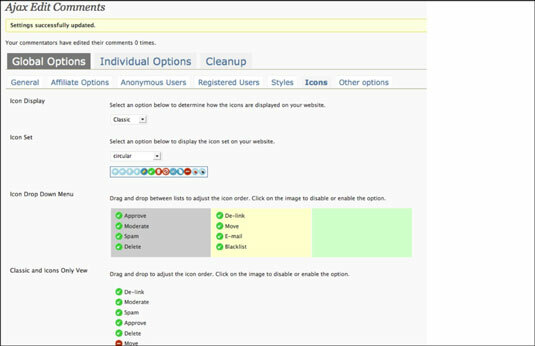 AJAX Edit Comments: The AJAX Edit Comments plugin lets administrators manage which visitors can edit their comments and what sorts of edits they can make. Additionally, it provides administrators with a comprehensive toolkit for managing comments. The AJAX Edit Comments plugin allows visitors to your WordPress blog or website to edit their comments, saves you time from editing bad comments, and resolves the issue of being unable to correct a typo in a comment. Originally, this feature was part of WordPress until it was removed some time ago. However, it was quickly replaced by this full-featured plugin, which makes the tasks much easier to manage. The AJAX Edit Comments plugin has evolved into a very powerful and easy-to-use comment manager. 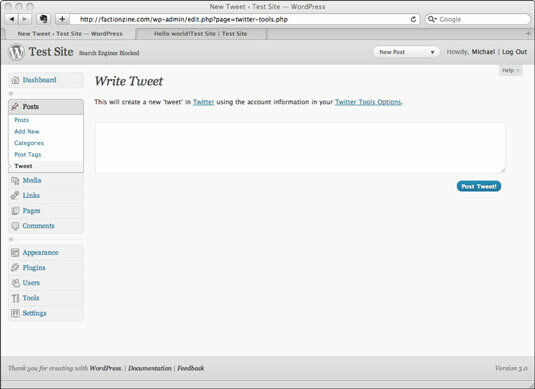 Twitter Tools: Twitter Tools integrates your WordPress blog or website and your Twitter account so that your tweets are pulled into your WordPress site as blog posts and your blog posts appear as tweets on Twitter. The Twitter Tools plugin is a full-featured integration option that’s easy to use, supports shortcode within sidebar widgets, and employs template tags if you aren’t using widgets. There’s even a method to allow developers to extend the plugin’s features. Contact Form 7: The Contact Form 7 plugin is great for creating and managing simple forms within WordPress. Forms can include contact pages where a visitor can enter his name and contact details and write a comment or question, or they can be questionnaires that ask for feedback on something you published on your blog or website. Forms provide a method to gather standard information and Contact Form 7 provides this in an easy-to-use WordPress plugin. You can install this plugin from your WordPress Dashboard by searching for Contact Form 7 on the Install plugins page, or you can download it from the WordPress Plugins Directory. Creating a form in Contact Form 7 is easy. You can include a number of field types on your form, such as text input, drop-down choices, checkboxes, and so on.